﻿ Bali Mandira Beach Resort & Spa (Indonesia) | FROM $107 - SAVE ON AGODA! "This suited us quite well, it was super quiet." 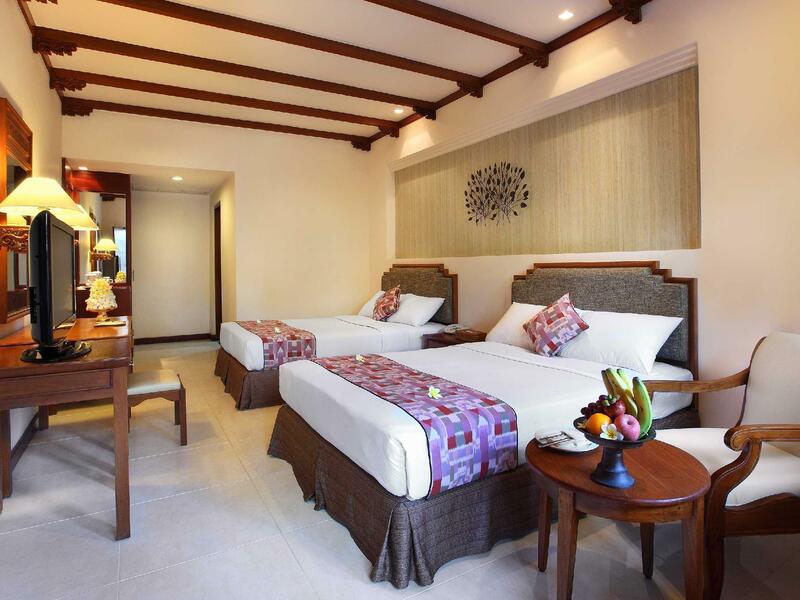 Have a question for Bali Mandira Beach Resort & Spa? "The staff were amazing and are always smiling, friendly and contribute to having the best holiday." "The facilities and grounds are amazing." "Great location overlooking the beach with 4 different but connecting pools for all ages." "Great pools, plenty of area to relax, great food in Azul res..."
Ideally situated in an exceptional area, the Bali Mandira Beach Resort & Spa will be a perfect choice for your holiday. Rated 4 stars, this resort is perfect for experiencing a truly memorable getaway. It has numerous convenient features, such as a currency exchange, an infirmary, safety deposit boxes, a laundromat, as well as a salon. Overlooking the pool and garden, it has appealing scenery for guests to enjoy. 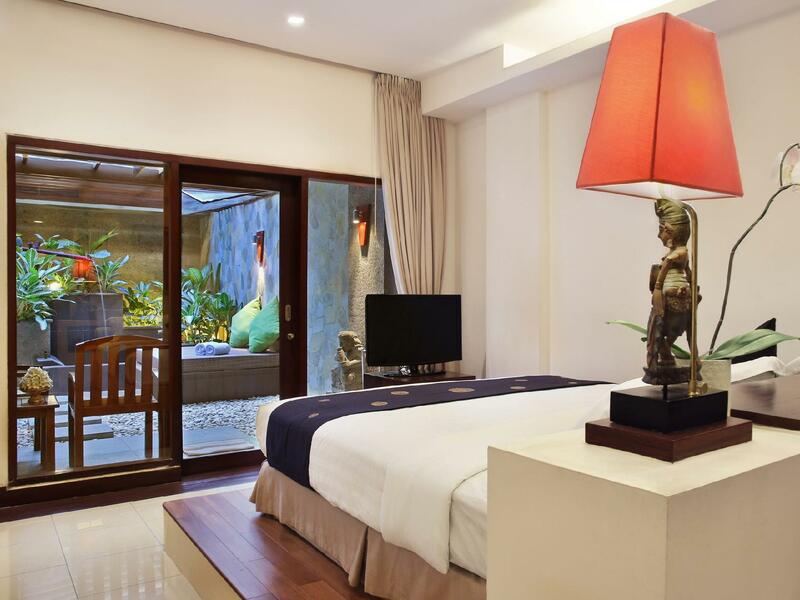 This Bali resort is near Windy Sun Surf School, Legian Beach, Ketut Art Shop 14, Pasar Seni UbadArt Market, and Alta Moda Fabric Store and Tailor. Featuring a garden, a spa, a hot tub, and an outdoor swimming pool, it is fully equipped to make your holiday as memorable as possible. The Bali Mandira Beach Resort & Spa offers an assortment of transportation options, such as airport transfers, car rentals, bicycle rentals, and shuttle services. 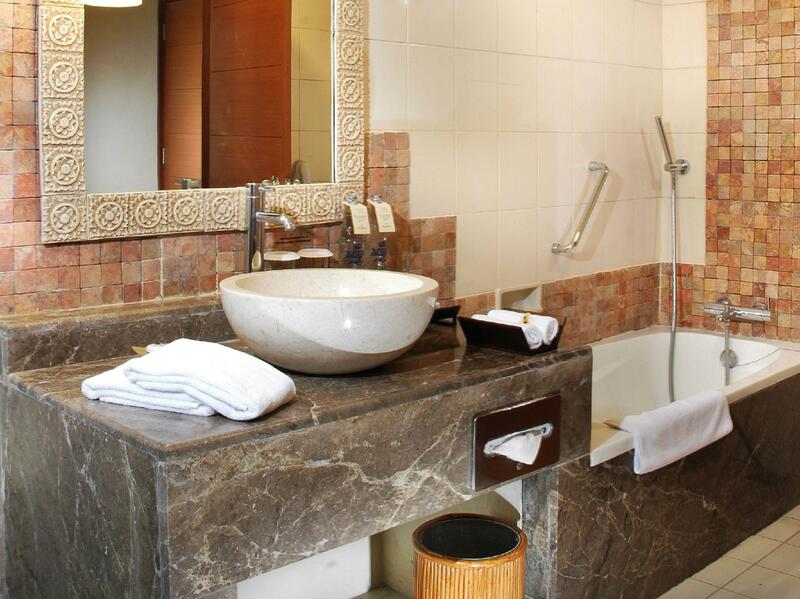 From a concierge to laundry services, this resort has numerous useful services for you to utilize. It offers a bar, a coffee shop, restaurants on-site, BBQ facilities, and a poolside bar, so there is a selection of dining and snacking choices. With Indonesian, American, and Asian restaurants nearby, you can choose your favorite cuisine. Have a delicious meal at Warong Miyabi, Caviar Cafe, EatWell Bali, Tony Roma's, Cosmic Diner or other eateries nearby. 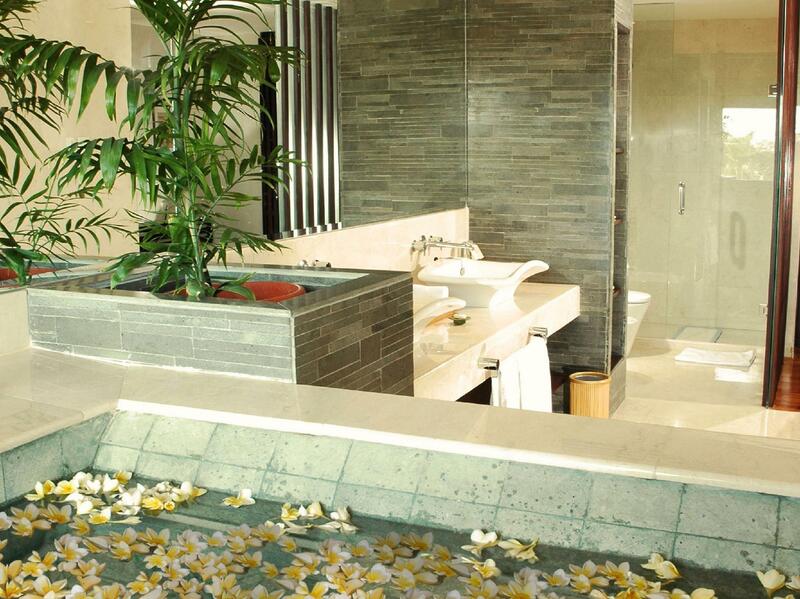 There are massage facilities in this area, so you can spend a few hours treating yourself to some pampering. With tours available, this resort is a great spot to stay to learn about the area and see everything you can while you're here. The Bali Mandira Beach Resort & Spa has a kids club, offering parents a safe childcare option to keep their children happy. This resort features a kids swimming pool, so your children can enjoy playing water games without bothering other guests. 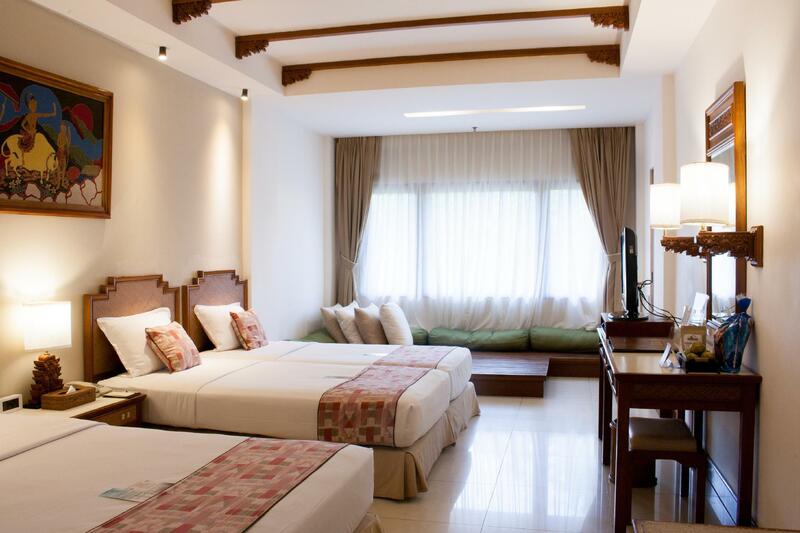 It is also equipped with family rooms and a playground to keep your children entertained throughout your stay. 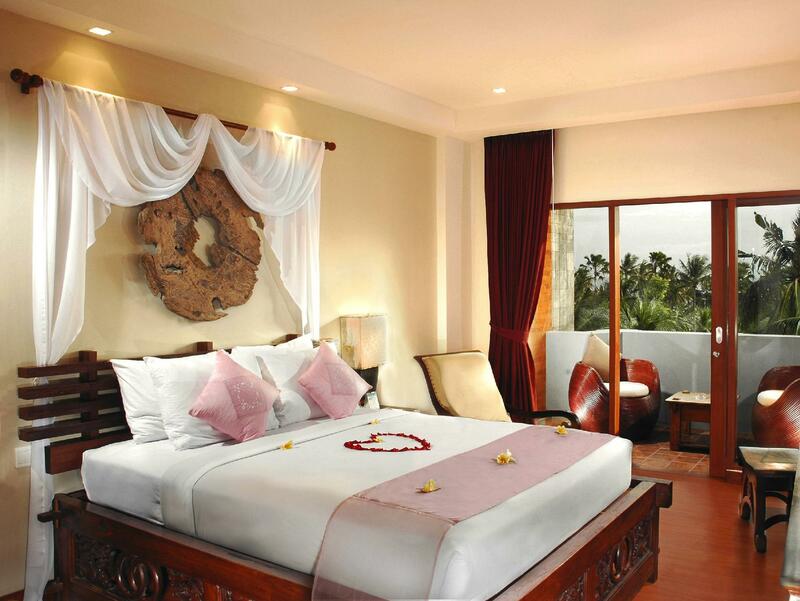 The Bali Mandira Beach Resort & Spa offers check-in from 02:00 PM and check-out until 12:00 PM. It has free Wi-Fi in all rooms, in addition to Wi-Fi in common areas, so visitors can connect with their friends and family back home without splashing out on international charges. It features an around-the-clock front desk, ensuring that there is always a member of staff on call to assist with any questions at all hours of the day or night. With pet-friendly facilities, the Bali Mandira Beach Resort & Spa is great for travelers who want to bring their pet on holiday with them. "Location and resort facilities are outstanding." Great location, The grounds are amazing. Clean, well maintained. The pool is fantastic for kids. Food is great also. The stuff always went out of ther way to help us. Cons Very expensive for what you get. The superior rooms are in desperate need to be refurbished, They are clean but still grubby. Old We were first placed Into one of these rooms which are located at the rear of the property. It was old and not really worth thit money at all, and then on top of that I was travelling with a small bang and they placed us directly on top of a room that was being renovated underneath. The drilling and banging went all day everyday. We requested to move which staff did. They moved us and upgraded us to a deluxe cottage which was away from the noise and a much nicer room for what you would expect to get at the Mandira. Still though I would not book this type of room and I believe it’s over priced. Superior area should be closed off to all paying guest while renovating. It’s greed! Beautiful resort! Amazing pool added plus of having an adult only pool it was so relaxing. Staff are brilliant & so helpful it was amazing! A big thank you to Citra & J.Frie for organising such wonderful dancing shows & gorgeous dinners! Food 10/10! The hotel layout is good, with huge swimming pool and good area for sun loungers, service is great but downside is that the hotel is very strict with towels issuance which causes a lot of inconvenience for a sunny resort. Another downside is the variety on their menu are very limited missing the very common bar food item (calamari; fried chicken wing etc). Over all, a great hotel and just right next to the beach. slides and buffet breakfast. The rooms are a little old but very spacious, comfortable and clean.Great standard of accommodation with the friendliest of staff .One of the best resorts I've ever stayed at. The pool areas are amazing, with adult and kids sections. Loved the location on the beach. Pool was one of the best anywhere I have stayed. Room was gorgeous, particularly loved the bathroom in the deluxe cottage with outdoor shower. Food at Barong Bar not great at all, especially for the price. Lots of loungers on grassy area around pool. We really enjoyed staying here. The deluxe cottage was lovely and spacious and the outdoor shower is quite nice. The club benefits are reasonable, however cocktail hour could be improved. The staff are really lovely and accommodating for any special requests. We will stay again. We had an amazing stay at the Mandira. Could not fault a single thing about our stay. We got married at the Mandira and the day was perfect. A huge thanks to Meta for organising such an amazing day for us! The pool & surrounds are just stunning, we spent most days in a cabana or at the swim up bar. The cocktails are Devine and our nephew who also stayed loved the water slides. We stayed in the private courtyard room and would stay there again, loved the outdoor bath and shower. The room came with the club package so free food & cocktails each afternoon. Between breakfast and afternoon tea I never needed to eat out. All staff were great, especially the guys working the night of our wedding. Our guests had so much fun with the guys that night that everyone was talking about it for days. If your looking in to getting married in Bali we highly recommend the Mandira. Not a single hitch, we chose the cocktail food Buffett menu and it was superb, our guests loved the selection and there was loads of food. The Band and photographer supplied were fantastic also. 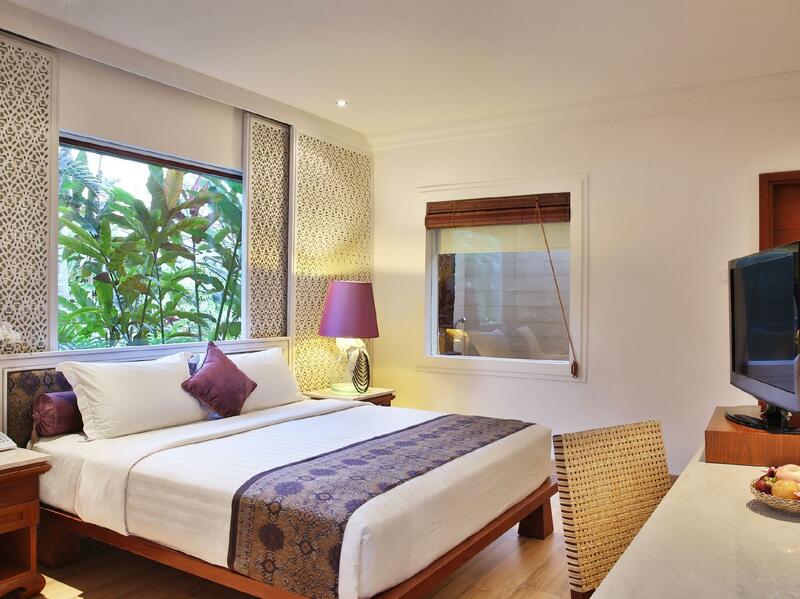 We definitely think the Mandira is the best resort in Legian! Location and resort facilities are outstanding. Family rooms are very disappointing for the price you pay. Very out dated and way too small for a family of four with two teenage daughters. Staff on check in were very rude and not accommodating. Great location overlooking the beach with 4 different but connecting pools for all ages. Kids loved the water slides & adults had their peaceful deeper areas to relax as well as swim up bars. Sensational breakfast with an amazing variety of fresh, cooked & gluten free food. Super clean & well maintained throughout. Very attentive, helpful & friendly staff who efficiently organised special taxis, mini buses or tours. Loved the special entertainment nights under the stars, with great modern dancers with a traditional twist. Excellent food & drinks service everywhere. Very relaxing & professional Day Spa. Even has a medical centre next door which was such a relief when one of the children became ill. There was even a little gift for her in her hotel room on our return, with a card wishing her a speedy recovery- a lovely thoughtful touch as we'd asked at reception for help finding a doctor. Good surf & surfing lessons at the beach in front so we'll be back again next year. Arrived late in the evening and my room was not ready for check in, staff then argued with me about the type of room I had requested (said I'd requested twin rooms, but I clearly booked a queen room and there was no such request), staff refused to check me in without a printed booking confirmation despite showing the paid booking on the agoda app. Room was virtually in the car park (and this was a deluxe room), so had to ask to move. Facilities are tired, there is clearly rusty metal in parts of the pool. Was served raw chicken at one restaurant. 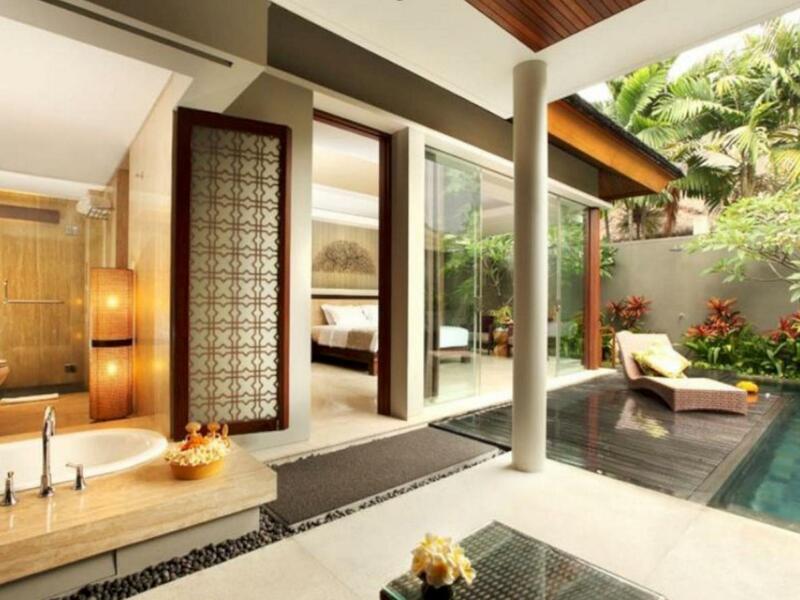 There is much better value and better facilities available in Bali. Beautiful gardens and lots of lounges around the pool area, great pool. A lot of shade so you dont have to sit in the hot bali sun. Staff very polite and go out of their way to help you. The rooms are very clean, probably getting a little on the older side, but comfy bed, great air conditioning and roomy enough. Breakfast is terrific, so many choices, I had breakfast at the Zula restaurant at the front and was wonderful, great view over the beach. We were a group of 20, and the hotel was great in accommodating all of us as close together as we could be. The staff were lovely, their facilities were great. I do believe the hotel is undergoing renovations but this did not affect our stay whatsoever. The only amenity I wish it had, is a gym. They do however have yoga daily and instead of going to the gym I enjoyed a nice walk along the beach which is directly along the hotel. The food at Azul is delicious! Highly recommend this hotel. Thanks Bali Mandira! We really enjoyed our stay at Bali Mandira. The staff were all very friendly and helpful. The garden and pool areas are fabulous and very relaxing. Enjoyed snacks and drinks by the pool each day. The beach is a quick walk across the road and is much cleaner than our last visit a few years ago. The rooms could be updated a little but are very comfortable and exceptionally clean. Location is good and central to Kuta or Seminyak. Our stay was fun and relaxing. Fantastic location on Legian beach and so close to restaurants. This hotel exceeded our expecations! We booked a superior room and were pleasantly surprised at check in when we were upgraded to a garden cottage. Would definitely recommend staying in the cottage! The staff are very friendly and helpful and he hotel itself is very clean. The pool is great, and full of families everyday. It was great also having an adults only pool where you can relax without the kids. We will surely be back for another stay! Gorgeous resort, great location, stunning views. Family friendly: Indonesian people love kids!! The staff goes out of their way to get to know you. We forgot a piece of baggage at the hotel, and one of the bellboys hopped on a motorcycle and raced to the airport to get it to us before our flight left! The pool was perfect, the water slide is so fun for both adults and children (it goes fast!). Everything is so clean. Honestly, we couldn’t have asked for a better place to spend our holiday. Second time staying at Bali mandira, absolute perfection. We just eloped and had our wedding in the resort. Words cant describe how special and magical it was. Throughout our stay staff went to and beyond to ensure we were well looked after, we stayed in delux club villa and then upgraded to pool villa on our last night. The sourroundings are stunning and the location is perfect, right opposite Beach (go see our friend wayan he will look after you at his Beach spot-agus bar) and so close to local markets restaurants etc. I highly reccomend the bali mandira for location, facilities, staff. Only one sad point is the price you can pay but to me is worth it.